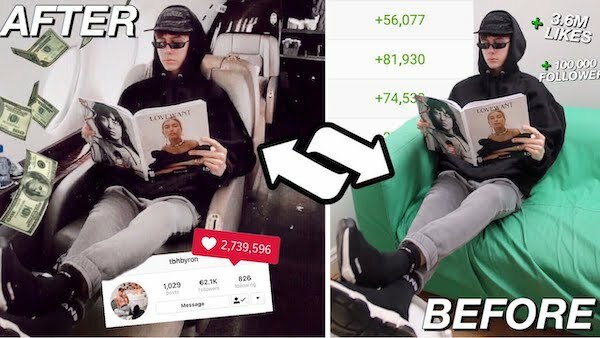 Keen to find out if money maketh popular Instagrammer, 19-year-old YouTuber Byron Denton from London doctored photos and footage to mimic the life of the ultimate online celebrity. Denton, who goes by the moniker ‘tbhbyron’ on social media, photoshopped himself in ridiculously extravagant scenarios for a week in a bid to see how much being ultra-rich could boost his online engagements. The YouTuber believably composited his head onto a picture of Jaden Smith carrying a couple of Louis Vuitton paper bags, edited himself in a private jet, and even placed his voice over existing footage to fake his own Instagram stories. The outcome was what he had envisioned; the doctored visuals considerably increased his follower count and gave him significantly more likes than he would typically expect. Before the experiment, a photo of Denton showing off his non-branded outfit accumulated about 2,000 likes; post-experiment, a picture where he’s flaunting a designer getup amassed over 12,000 likes. The project was inspired by videos like the one created by YouTuber George Mason, who pretended to visit Spain, France, Netherlands, Italy and Greece in a single week. Check out an abridged, five-minute version of Denton’s project in the video below, and watch the full 14-minute experiment beneath it.